The CXQ-1 is a compact high-density transport stream converter. The CXQ-1 converts up to four DVB-ASI streams to TSoIP. The four TSoIP streams are output on a single Ethernet connector. The CXQ-1 complies with both the DVB-ASI and SMPTE 2022 standards. The TSoIP interface supports transport stream encapsulation, forward error correction and UDP/RTP de-encapsulation as defined by the SMPTE 2022 standard. The CXQ-1 has administrative management controls to assign user names and passwords to control user accounts. All configuration and network settings can be saved and recalled with user defined presets as well as a power on default in the event of a power cycle. The CXQ-1 transport stream converter is ideal for routing video throughout a plant or delivering video to a remote transmitter site where IP is the preferred interface. 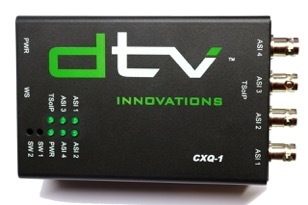 A CXQ-1 can reliably convert up to four DVB-ASI streams to TSoIP.